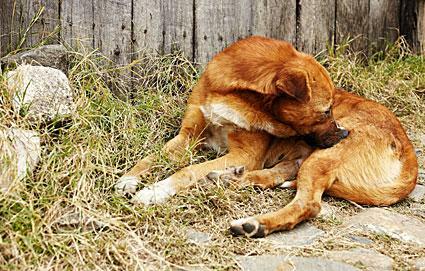 Learning how to identify flea bites and knowing how to treat them is important for you and your dog. After all, both of you can be bitten by these parasites and suffer intense itching so get some tips for fast relief. In order to identify fleas as the culprit causing the trouble, you need to know what flea bites actually look like. Each bite results in a tiny raised red welt that is typically no bigger than the head of a pin. Scratching tends to increase the size of the welts and inflames the whole general area. Flea bites itch for the same reason that mosquito bites do. A protein in the flea's saliva sparks an allergic/histamine reaction from the immune system, causing the release of anti-histamines to attack the saliva and break it down for transportation from body. An individual's level of discomfort depends on just how allergic they are to the saliva. For some, a flea bite only causes minor irritation; for others, a single flea bite can cause intense itching and inflammation. Above all, resist the urge to scratch a flea bite. Scratching only triggers the release of more anti-histamine from your immune system, perpetuating the itch. Scratching can also rupture the skin, offering an entry point for other organisms that can cause secondary infections. You can try the following measures to relieve your flea bites. Wash the bites with soap and water. Apply an ice pack to numb the bites and reduce the swelling. Apply a topical anti-itch cream or Calamine lotion to each bite. Over-the-counter anti-histamines such as Benadryl may also stop the reaction, but it's a good idea to check with your physician before you take any medication. 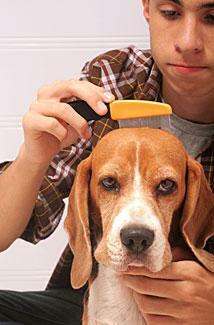 You can bathe your pet with a species-appropriate insecticidal shampoo. You can also rinse your pet in flea dip. Caution: Never use flea shampoo and dip simultaneously or you can dangerously over-medicate your pet. You might choose to apply a flea-preventative medication such as Advantage or Frontline. Try flea collars and powders to control fleas although they are generally less effective than the products previously mentioned. Your pet may still have to deal with the effects of the bites even after you rid them of the fleas. Your vet may suggest administering an oral steroid for a week or so to help relieve the worst of the itching. You can treat your own flea bites, and de-flea your pet, but you won't be able to eliminate a flea infestation unless you treat your yard and home at the same time. Ortho's Liquid Sevin is designed to spray on your lawn and is very effective against fleas. It will kill any mature fleas in the area it's used, but it's not effective on their eggs, so your lawn will require a second treatment two weeks later to eliminate new hatchlings. Once the population is under control, you can spray once a month or so for maintenance. The next step is ridding your home of fleas. These pesky insects spend a great deal of time on their hosts. Still, they do occasionally drop off to lay their eggs in crevices around your home, so it's necessary to treat your house too. Add one or two mothballs to your vacuum bag while thoroughly vacuuming your carpet and furniture, making sure to get under the cushions and into deep crevices. Don't forget the areas under your furniture either or you may be leaving fresh eggs behind to replenish the population. Wash your pet's bedding. If it's non-washable, you can try vacuuming it, or you can simply throw it away and purchase a new one. If your pet shares your bed, you should wash your bedding on the same day you treat the rest of the household. You may find it easier to use a product called a flea bomb to release an insecticidal fog throughout your home to kill fleas and their eggs. These products should be used exactly according to the directions. Also plan for you and all of your pets to spend the day away from your home until the process is complete. If bombing your own home doesn't appeal to you, leave the job to a pest control professional. Flea bites are irritating at the least, but they can also lead to other health problems. Be pro-active about ridding your pets and property of these pesky pests. Check both yourself and your animals for signs of tapeworm infestation if you've been bitten.